The Tulips that Started It All! There's no doubt that Holland is the motherland of the modern tulip, but did you know the earliest-known tulips were first discovered growing wild in Central Asia and present-day Turkey? Imported to Holland in the 16th century, those original species looked quite different from the carefully bred Dutch hybrids that are popular today. 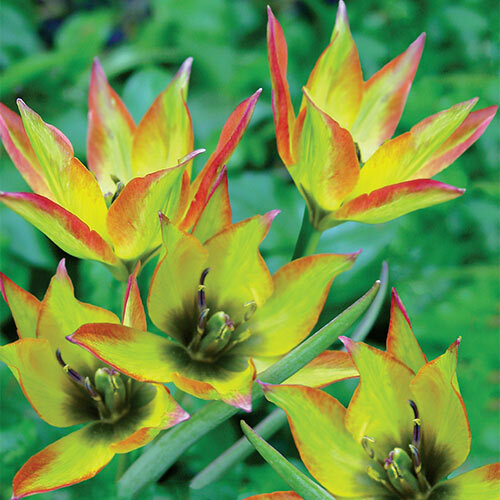 Smaller overall, with multiple blooms per stem, they also open wider, revealing prominent flower centres in a contrasting colour to the rest of the bloom. 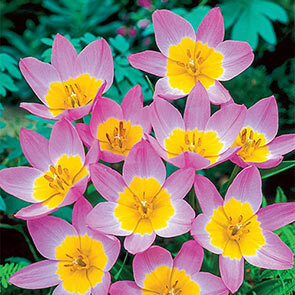 Commonly called species tulips, non-hybrid varieties can still be found growing wild in regions of Asia and the Middle East. 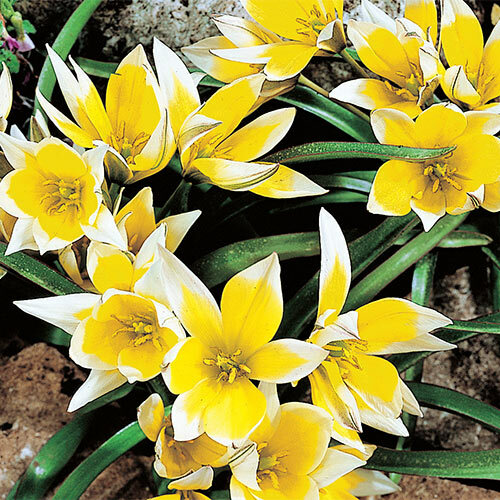 Traveling tulip lovers are often shocked to see these delicate-looking flowers thriving in mountainous and desert environments. In recent years, gardeners worldwide have united in concern over the decline in the bee population. Scientists have offered many theories to explain the cause of this phenomenon, including parasites, pesticides and loss of habitat. But one thing the experts agree on is the importance of these beneficial pollinators in our daily lives. One way that home gardeners can help bees succeed is to plant more flowers that these pollinators prefer. 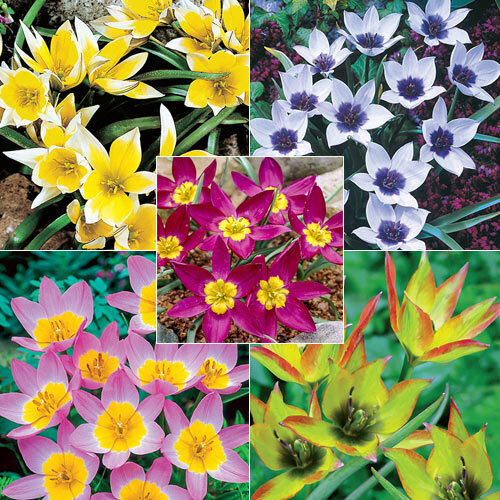 Species tulips, like the ones in our Wildflower Tulip Collection, open wider than modern hybrids, giving bees easy access to the tasty treasures inside. Flower nectar gives adult bees energy, and the precious pollen is brought back to the hive to share with the rest of the colony. In the case of honey bees, the nectar is also used to create honey, which is then stored for winter nourishment. When most people think of tulips, they likely picture large, egg-shaped blooms atop knee-high stems. 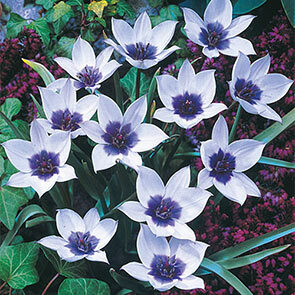 But those tulips are the result of centuries of hybridization. 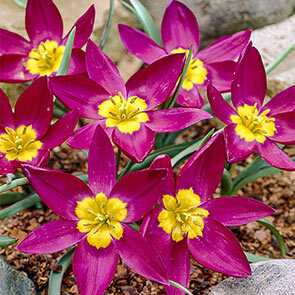 True tulip lovers also make room in their gardens for unconventional species tulips, which naturalize beautifully and open wide for bees and butterflies. All five varieties in our Wildflower Tulip Collection have incredible naturalizing qualities. Not surprising, since their ancestors reproduced in the wild for centuries. And unlike Dutch hybrid tulips, Wildflower Tulips don't require a chilling period to bloom the following spring. That means they're a low-maintenance option for warmer regions as well. Flower Form Depending on the items in the collection, various forms.